A good measuring of the temperature in the washing equipment was, certainly in CBW´s with an inner and outer drum, not possible. Initially there was tried to get an image of the (internal) temperature of on CBW by using temperature strips. Often was found that the set temperature was barely achieved, and in some types of CBW the with the temperature strips measured temperature was more then 20°C below the set value. One of the main disadvantages of the temperature strips was that only a maximum temperature was recorded and the duration of this temperature was not known. This could vary from several seconds to several minutes. The temperature strips also did not give information of the temperature in the first and last zones of the CBW. Another form of measuring the temperature in washing equipment was therefore desired. That measurement should give more information of the temperature gradient in the washing equipment. This need for an other way of measuring the temperature has led to the development of the TRM. Such temperature meter should be resistant to the applied wash temperatures (then common in use 85-95°C) various chemicals used in the washing process mechanical washing action pressure in the de-watering press (in the time, the applied pressures are increasing) and response time of the meter should be sufficient to give a fair indication of the temperature during the washing process. The strong variations in the temperature gradient had to be visualized and in situations where the results were insufficient a washing process could be adjusted for improving the washing process. The purpose of the measurement is to get an impression of the course temperature of the laundry during the washing process. This temperature can be different from the temperature curve of the water in the washing process, e.g. because of the heat content of the laundry and the heat exchange in the laundry. In the washing process there are many factors that influence the temperature measurement such as water level, the mechanical washing action, the degree of flow or counterflow in the zones, the type of laundry, the degree of exchange between inner and outer drum, the steam pressure, the load factor and the loading capacity of the CBW, the hysteresis of the temperature control and the deviation in measuring of the temperature of the CBW (sometimes a not well-regulated thermocouple, or an uncompensated Pt-100 measurement). Because of all these possible influences an exact measurement of temperature inside the laundry is not possible, but also not necessary, because the temperature inside the laundry will almost never be homogeneously distributed. An applied temperature meter needs to have a quite quick response to follow the temperature gradient of the laundry in the CBW. Despite the necessary construction, to meet the before mentioned chemical and mechanical conditions, the TRM has a small hysteresis. Since in a CBW the temperature-jumps between successive courses are often not very large, the hysteresis of the meter in a fluid environment is less important. The TRM is not developed for (accurate) temperature measurements in air or gas and is therefore not suitable. The accuracy of the TRM is as a result of the selected components, very good. An important aspect is the "packing" of the TRM in textile (washcloth / towel). The TRM has to be able to move freely within the "packing". When this is not possible the TRM will be rinsed insufficient by the process water and deviations in the measured values will arise. To give an idea about the response time of the TRM we will give you some values of the t90 which is a well known and frequently used item to illustrate the response time. At first sight you might think that the response time of the temperature jumps 35 - 75°C, 50 - 75°C and 50 - 85°C is rather long but we will try to show you that temperature jumps of that kind rarely if ever will appear in the washing process and that the response time is sufficient to give a good impression of the " textile temperature". Sometimes the temperature jumps in the washing machine seems to be huge. When the steam supply is near to the temperature sensor, especially in the double drum machines, the temperature seems to rise very quickly but the temperature inside rises less quick. When there is a bath exchange e.g. draining of water of 35°C and intake of water of 85°C often is thought that the temperature rise will be huge. But when there is per kg textile about 2 litres of water 35°C left behind and there is a supply of 2 litres of water 85°C per kg textile the resulting temperature will be ± 60°C. Even when there is 1 l/kg of 35°C and 3 l/kg of 85°C there will be only a resulting temperature of ± 72°C. So there is only a "temperature jump" from 35°C to 60/72°C (instead of 85°C). Besides that it will also take some mixing time before the end temperature is reached. That time is often (much) longer than 1 minute. By means of some examples we will try to explain the cause(s) of several situations you probably will find in practice. There are some (continuous) batch washers that have trouble with the exchange between inner and outer drum. The temperature graph will show you a slow rise in temperature which is not the result of the (mis)functioning of the TRM. The next graph will show the temperature development in a batch washer where the steam supply is near to the temperature sensor. The supply of the main wash is water of 80°C. Though the temperature of the main wash is programmed 90°C the first 1½ minute the warming up of the machine is slowed down. In practice the steam valve opens still a lot of times after the first time reaching the wanted temperature. Similar situations are found in continuous batch washers where the slowed down warming is a result of the steam supply / sensor combination and the limited exchange between inner and outer drum. 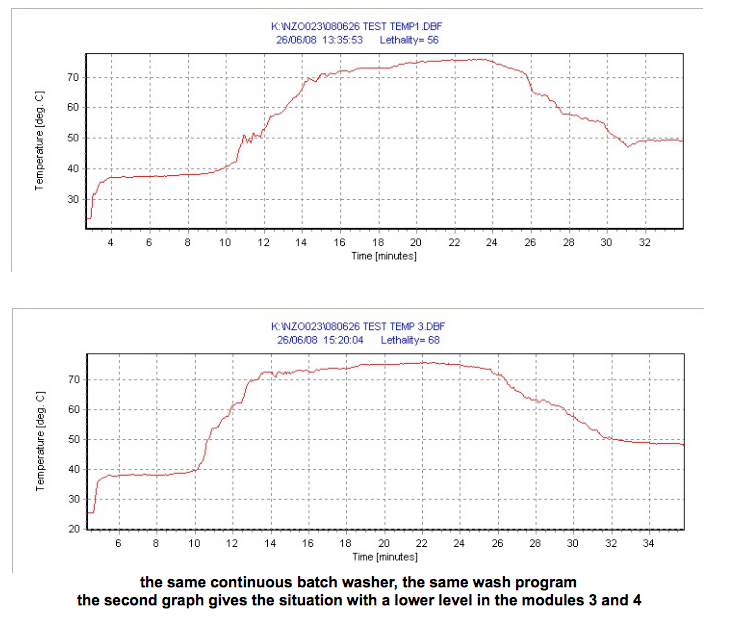 In practice we found that some continuous batch washers in particular show a slowed down warming. This is also confirmed by our customers that are using the TRM now several years for controlling the washing processes in different laundries. The higher the load of textile the more water is in the drum and the heating is not always capable to warm that mass of water in the cycle time. The heating takes place between the inner and outer drum and therefore it often seems that the temperature is reached, but that is only the temperature between the drums. The heated water has to be transported into the inner drum and the speed of transportation is depending on several factors as earlier described in this document. In the graph you find a situation with several rather small deviations which altogether lead to the presented temperature curve. The temperature of the supplied water at the throw in side was ± 28°C and the time on that temperature corresponds with the expected time (3x 2 minutes cycle time). In module 4 is a bath exchange applied and after filling with recycle water the heating takes place (programmed 75°C). Further heating in the modules 5 and 6 (75°C). At the end of the cycle time in module 6 the highest temperature is reached inside, but it does not yet meet the programmed 75°C. This is not the result of a misfunctioning of the TRM but this is the result of several factors. In the following graphs you find the same machine and the same washing program. The difference is the result of the water levels of module 3 and 4 (first of main wash) that are set lower (overflow level). Less "cold" water is taken to the main wash and in combination with the lower level in module 4 the new situation leads to a quicker warming. The remaining temperature deviation was caused by the adjustment of the temperature system. The thermocouple was not well-regulated. The on the machine showed temperature was ± 4°C higher than the real temperature. The next graph shows a rather normal situation with a rather good exchange between inner and outer drum. The first main wash module is not steam heated but is warmed up by the warm water counterflow. The by the TRM measured main wash temperature is 74°C and programmed was 75°C.